Brooks & Dunn is an American country music duo consisting of Kix Brooks and Ronnie Dunn, both vocalists and songwriters. The duo was founded in 1990 through the suggestion of Tim DuBois. Before the foundation, both members were solo recording artists. Both members charted two solo singles apiece in the 1980s, with Brooks also releasing an album for Capitol Records in 1989 and writing hit singles for other artists. Founded in 1991, the duo signed to Arista Nashville that year. They have recorded eleven studio albums and five compilation albums for the label. They also have released 50 singles, of which 20 went to No. 1 on the Hot Country Songs charts and 19 more reached Top 10. Two of these No. 1 songs, "My Maria" (a cover of the B.W. Stevenson song) and "Ain't Nothing 'bout You", were the top country songs of 1996 and 2001, respectively, according to the Billboard Year-End charts. The latter is also the duo's longest-lasting No 1 single on that chart at six weeks. Several of their songs have also reached the Billboard Hot 100, with the No. 25 peaks of "Ain't Nothing 'bout You" and "Red Dirt Road" being their highest there. Brooks & Dunn also won the Country Music Association Vocal Duo of the Year award every year between 1992 and 2006, except for 2000. Two of their songs won the Grammy Award for Best Country Performance by a Duo or Group with Vocal: "Hard Workin' Man" in 1994 and "My Maria" in 1996. All but two of the duo's studio albums are certified platinum or higher by the Recording Industry Association of America; their highest-certified is their 1991 debut album, Brand New Man, which is certified sextuple-platinum for shipments of six million copies. The duo's material is known for containing influences of honky-tonk, mainstream country, and rock, as well as the contrast between Brooks' and Dunn's singing voices and on-stage personalities, although some of their music has also been criticized as formulaic. Their 1992 single, "Boot Scootin' Boogie", helped re-popularize line dancing in the United States, and 2001's "Only in America" was used by both George W. Bush and Barack Obama in their respective presidential campaigns. Brooks & Dunn has collaborated with several artists, including Reba McEntire, Vince Gill, Sheryl Crow, Mac Powell, Billy Gibbons, and Jerry Jeff Walker among others. After announcing their retirement in August 2009, they performed their final concert on September 2, 2010 at the Bridgestone Arena in Nashville, Tennessee. Both Brooks and Dunn have continued to record for Arista Nashville as solo artists. Dunn released a self-titled album in 2011, which included the Top 10 country hit "Bleed Red", while Brooks released New to This Town in September 2012. The duo reunited in 2015 for a series of concerts with Reba McEntire in Las Vegas, Nevada. In 2019, the duo were inducted into the Country Music Hall of Fame. Leon Eric Brooks III was born on May 12, 1955, in Shreveport, Louisiana and before moving to Nashville, Tennessee in 1976, he played at various venues in Maine. He was also a neighbor of country singer Johnny Horton. Brooks worked as a songwriter in the 1980s, co-writing the number-one singles "I'm Only in It for the Love" by John Conlee, "Modern Day Romance" by the Nitty Gritty Dirt Band, and "Who's Lonely Now" by Highway 101, plus The Oak Ridge Boys' Top 20 hit, "You Made a Rock of a Rolling Stone", Nicolette Larson's "Let Me Be the First", and Keith Palmer's "Don't Throw Me in the Briarpatch". Brooks also released several singles through the independent Avion label, charting at No. 73 on Hot Country Songs in 1983 with "Baby, When Your Heart Breaks Down". In 1989, he released a self-titled studio album through Capitol Records. This album included "Baby, When Your Heart Breaks Down" and the #87 single, "Sacred Ground", which McBride & the Ride covered and took to No. 2 on the country charts in 1992. Brooks and Pam Tillis co-wrote and sang on "Tomorrow's World", a multi-artist single released on Warner Bros. Records in 1990 in honor of Earth Day, which peaked at #74 on the country charts. Brooks also co-produced and co-wrote "Backbone Job", a Keith Whitley outtake that appeared on his 1991 compilation album, Kentucky Bluebird. Ronnie Gene Dunn was born on June 1, 1953, in Coleman, Texas. He played bass guitar in local bands during high school and he briefly studied theology at Hardin-Simmons University with the intention of becoming a Baptist preacher. Dunn was "kicked out" of the school because he played in bars. Between 1983 and 1984, he recorded for the Churchill label, taking both "It's Written All Over Your Face" and "She Put the Sad in All His Songs" to No. 59 on the country charts. In 1989, session drummer Jamie Oldaker entered Dunn in a talent contest sponsored by Marlboro, which he won. The grand prize in the competition included a recording session in Nashville, Tennessee. The producer of that session, Scott Hendricks, recommended Dunn's recordings to Tim DuBois, then an executive of Arista Nashville. DuBois paired Brooks and Dunn because he thought that they would work well together as songwriters, and after the two recorded a demo, he suggested that they form a duo. During this timespan, Dunn also wrote "Boot Scootin' Boogie", which Asleep at the Wheel recorded on their 1990 album, Keepin' Me Up Nights. Brooks & Dunn's debut album Brand New Man received 6× Platinum certification in the U.S. and produced four number 1 hits. Brooks & Dunn's first single, "Brand New Man", entered the Hot Country Songs charts in June 1991 and went to No. 1. It was the title track to the duo's debut album, Brand New Man, which was released two months later. Brooks and Dunn wrote this song and several other cuts in collaboration with songwriter Don Cook, who co-produced the album with Hendricks. It was also Cook's first credit as a producer. The next three single releases from Brand New Man ("My Next Broken Heart", "Neon Moon", and their own rendition of "Boot Scootin' Boogie") all made number one on the country music charts as well, making for the first time in country music history that a duo or group had sent its first four singles to the top of the charts. A fifth single, "Lost and Found", peaked at number six. "Boot Scootin' Boogie", which had previously been the B-side to "My Next Broken Heart", also made number 50 on the Billboard Hot 100, and its commercial success led to a renewed interest in line dancing throughout the United States. Brand New Man was certified platinum by the Recording Industry Association of America (RIAA) in August 1992 for shipments of one million copies; by 2002, the album had been certified sextuple-platinum for shipments of six million. It spent more than 190 weeks on the Top Country Albums charts. In 1992, the duo won the Duo of the Year Award from the Country Music Association (CMA), which also nominated them for that year's Album of the Year and Horizon awards. Brooks & Dunn won the association's Duo award for every year from then until 2006, except for 2000 when the award went to Montgomery Gentry. After the album's release, Brooks & Dunn began touring as well. Brand New Man received a positive review from Allmusic, whose critic Daniel Gioffre thought that the album showed the duo's diversity of musical influences. Alanna Nash of Entertainment Weekly was less positive, criticizing the duo's sound for being "imitative". Hard Workin' Man was the title of Brooks & Dunn's second album, which was released in 1993. The title track, also its first single, peaked at number 4 on the country music charts. The album included two number-one singles in its third and fifth releases: "She Used to Be Mine" and its B-side, "That Ain't No Way to Go". "We'll Burn That Bridge" and "Rock My World (Little Country Girl)" (respectively the second and fourth releases) both made Top 5 on Billboard, with the former reaching number one on Radio & Records. Also included on the album was a remix of "Boot Scootin' Boogie". In 1994, "Hard Workin' Man" won the duo a Grammy Award for Best Country Performance by a Duo or Group with Vocal, and the album was nominated for Best Country Album. Hard Workin' Man earned its highest RIAA certification in 2002, when it was certified quintuple platinum. Brian Mansfield gave a generally positive review in Allmusic, saying that its up-tempo songs "rocked harder" than any of the songs from the first album. By the end of 1994, the duo released their third studio album, Waitin' on Sundown. It also produced five charting singles, three of which made number one on the country charts: "She's Not the Cheatin' Kind", "Little Miss Honky Tonk" and "You're Gonna Miss Me When I'm Gone". The other two singles, "I'll Never Forgive My Heart" and "Whiskey Under the Bridge", both made top ten. Allmusic critic Thom Owens thought that the album's singles were "solid" but that the rest of the songs were "filler". A review of the single "She's Not the Cheatin' Kind" from the same site praised it for its "hard-driving, honky-tonk spirit". Nash praised the honky-tonk sound of "I'll Never Forgive My Heart", but thought that most of the other songs relied on "contrivance". Randy Lewis of the Orlando Sentinel gave a generally positive review, saying that the "minidrama" of "A Few Good Rides Away" (which Brooks co-wrote) was the strongest track on the album. The first single from Brooks & Dunn's fourth album, Borderline, was a cover version of B.W. Stevenson's 1972 single "My Maria". Brooks & Dunn's version of the song spent three weeks at number one in mid-1996 and peaked at number 79 on the Billboard Hot 100; it was also that year's top country song according to the Billboard Year-End charts. Dunn said that he was initially reluctant to record "My Maria" because the duo had not previously recorded any cover songs. The song won Brooks & Dunn its second Grammy Award for Best Country Performance by a Group or Duo, and the duo won the 1996 Entertainer of the Year award from both the Country Music Association and Academy of Country Music, making them the first duo to win that award from the former. In 1997, Brooks & Dunn joined a double-headliner tour with Reba McEntire. Borderline produced another number one in "A Man This Lonely", along with the top ten hits "I Am That Man" and "Why Would I Say Goodbye". "Mama Don't Get Dressed Up for Nothing", the third single and B-side to "My Maria", became their first release not to make the top ten. Michael McCall of Allmusic and Alanna Nash of Entertainment Weekly both thought that the album's material was "cliché" and that "My Maria" was the strongest song on it. A more positive review came from Larry Stephens of Country Standard Time, who thought that the album had "the right mix" of songs. Their first greatest hits compilation was released on September 16, 1997. It comprised most of their singles to that point and three new songs: "Honky Tonk Truth", "He's Got You", and "Days of Thunder". The first two were released as singles, with respective peaks of three and two on the country charts. The Greatest Hits Collection was certified platinum in April 1998, and double-platinum in 2001. Brooks & Dunn recorded "If You See Him/If You See Her" with Reba McEntire, who later provided a guest vocal on a re-release of the duo's 2008 single "Cowgirls Don't Cry". Brooks & Dunn collaborated with Reba McEntire to perform "If You See Him/If You See Her", which was the lead-off single to Brooks & Dunn's If You See Her and McEntire's If You See Him, both of which were released on the same day. Arista Nashville and MCA Nashville, the label to which McEntire was signed, both promoted the single. This cut went to number one, as did If You See Her's next two singles: "How Long Gone" and a cover of Roger Miller's "Husbands and Wives", which also became the duo's first top 40 hit on the Billboard Hot 100. Dunn recorded the vocals for "Husbands and Wives" in one take. Also included on the album was "Born and Raised in Black and White", the first song of the duo's career in which they alternated on lead vocals. The album's fourth single was "I Can't Get Over You", which was a top five country hit. Following it was "South of Santa Fe", which peaked at number 41 on the country charts and thus became the duo's lowest-peaking single there. In 2001, If You See Her reached double-platinum certification in the United States. Jana Pendragon, in her review for Allmusic, praised Dunn's vocal performances on "Husbands and Wives" and "You're My Angel", but thought that a couple of the other cuts were "formula". Country Standard Time writer Kevin Oliver criticized the album for having "wildly uneven" material, calling the McEntire collaboration a "snoozer" and "South of Santa Fe" "wretched". Tight Rope (1999), the duo's sixth album, was also its least commercially successful release. It included three singles: a cover of John Waite's "Missing You", followed by "Beer Thirty" and "You'll Always Be Loved By Me". The former two failed to make Top 10, while the latter peaked at number 5 in 2000. Dunn co-wrote some songs on this album with McBride & the Ride lead singer and bassist Terry McBride (who would later join Brooks & Dunn's road band), and Brooks collaborated with Bob DiPiero. The duo shared production duties with Byron Gallimore on all three singles and four other songs on the album, while retaining Cook as producer on the other six. While "Beer Thirty" was climbing, the album cut "Goin' Under Gettin' Over You" charted as high as number 60 based on unsolicited airplay. Tight Rope was certified gold for U.S. shipments of 500,000 copies, but did not receive any higher certification. Stephen Thomas Erlewine gave this album a mixed review, referring to the "Missing You" cover as a "misstep". Jon Weisberger thought that the album was "consistent" but added that it did not have any "surprises". Brooks revealed in 2015 that the album's poor performance almost led to the duo splitting up, as he felt that “We weren’t really writing together anymore, and we were just kind of done", but they ultimately stayed together at the suggestion of Joe Galante, then the head of their label. In addition to persuading the duo to stay together, Galante suggested that they record the song "Ain't Nothing 'Bout You", because he felt it had potential as a hit. The song served as the lead single from their seventh album, 2001's Steers & Stripes. It became their longest-lasting number 1, with a six-week stay at that position. This song was the second song of the duo's career to be named the top single of the year according to Billboard Year-End; it was also their highest peak on the Billboard Hot 100 at the time, peaking at number 25 there. For this album, the duo worked with producer Mark Wright, who also produced for Lee Ann Womack and Gary Allan at the time. The next two singles from Steers & Stripes both made number 1 as well: "Only in America" and "The Long Goodbye", the latter of which was written by Irish pop singers Ronan Keating and Paul Brady. After it, the duo charted at number 5 with "My Heart Is Lost to You" and number 12 with a cover of Kim Richey's "Every River", featuring a backing vocal from Richey. All of these other singles also made the pop charts. "Only in America" was later used by George W. Bush in his 2004 re-election campaign, and again in 2008 by Barack Obama in his campaign. Noting that the song was used by both a Republican and a Democrat candidate, Brooks (who wrote the song with Cook and Ronnie Rogers) said that it was "very flattering to know our song crossed parties and potentially inspires all Americans." This album was generally well received, with the reviews in Allmusic and Country Standard Time noting that the album was more consistent than the previous ones. Nash was less favorable, referring to the up-tempos as "retreads" but praising Dunn's voice. Brooks & Dunn released a Christmas album in 2002 titled It Won't Be Christmas Without You. Four of its cuts made the country music charts based on seasonal airplay: the title track, "Hangin' 'round the Mistletoe", "Rockin' Little Christmas" and a rendition of "Winter Wonderland". It was followed in early 2003 by the duo's eighth studio album, Red Dirt Road, whose title track became the duo's eighteenth number one on Billboard. Two more singles were released from it: "You Can't Take the Honky Tonk Out of the Girl", which spent five weeks in the number three position, and "That's What She Gets for Loving Me" at number six. On the Hot 100, these songs respectively peaked at 25, 39 and 53. As with Steers & Stripes, Red Dirt Road was certified platinum. Erlewine described Red Dirt Road as a concept album in his review of it, saying that its title track and other songs offered a "tribute to their roots and upbringing." Nash gave the album an A-minus rating, saying that Brooks & Dunn "dig even deeper" on the album; she also referred to the title track as a "gutsy account of the terrible beauty of coming of age." A less favorable review came from Country Standard Time, whose critic Jeffrey B. Remz called it "satisfactory, but not much more." Both Nash and Remz compared "You Can't Take the Honky Tonk Out of the Girl" to the sound of The Rolling Stones. Arista Nashville released Brooks & Dunn's second Greatest Hits package, The Greatest Hits Collection II, in October 2004. The album included singles from If You See Her, Steers & Stripes and Red Dirt Road, and the previously unreleased "That's What It's All About" and "It's Getting Better All the Time". Respectively, these cuts peaked at numbers two and one on the country music charts, as well as 38 and 56 on the Hot 100. In August 2005, the duo released the single "Play Something Country". According to Dunn and co-writer Terry McBride, it was inspired by Gretchen Wilson, who was touring with Brooks & Dunn and Big & Rich on the Deuces Wild tour at the time. "Play Something Country" was the lead-off to their ninth studio album, Hillbilly Deluxe. Brooks & Dunn co-produced with Tony Brown, with further production from Mark Wright on "My Heart's Not a Hotel". A month after the album's release, "Play Something Country" became the duo's twentieth and final number one on Hot Country Songs, and went to number 37 on the Billboard Hot 100. The album's second single, "Believe", peaked at number eight, also winning the next year's Single of the Year and Song of the Year awards from the Country Music Association. After it was "Building Bridges", with guest vocals from Vince Gill and Sheryl Crow, which peaked at number four. Before the duo released this song, it had been released by co-writer Larry Willoughby, a cousin of country singer Rodney Crowell, and later by Nicolette Larson. The final release from Hillbilly Deluxe was the title track, which peaked at number sixteen on Hot Country Songs. Erlewine gave this album a positive review, saying that it was not "quite as ambitious" as the previous two albums, but "just as satisfying". 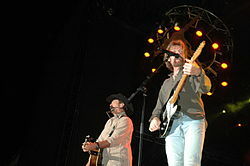 Brooks & Dunn began the Long Haul tour in mid-2006, which featured Sugarland and Jack Ingram as opening acts. Of this tour, Brooks said, "They've got a lot of shows under their belt, they're really good at what they do, and they are great performers[…]We want everything about this show from opening act 'til the lights go down to be first class." Their tenth studio album, Cowboy Town, was released on October 2, 2007. Its lead-off single "Proud of the House We Built" reached number 4 on the country charts and 57 on the Hot 100. Following this song were "God Must Be Busy" at number 11 and "Put a Girl in It" at number 3. After this song, the duo released "Cowgirls Don't Cry", which they later performed with Reba McEntire at the Country Music Association awards. Following this performance, the song was re-released partway through its chart run with McEntire dubbed into the final chorus. In early 2009, the song peaked at number two on the country charts. Although not released as a single, the title track spent three weeks on the charts and peaked at number 56. Also included on the album is a collaboration with Jerry Jeff Walker on "The Ballad of Jerry Jeff Walker". Cowboy Town was also the name of the duo's 2009 tour, which featured Rodney Atkins and ZZ Top. The tour began on June 6 at the BamaJam festival in Enterprise, Alabama. Stephen Thomas Erlewine wrote that "Brooks & Dunn have crafted these songs[…]with an eye on the middle of the road, and they do it well enough that this music will likely win them that audience yet again." Mikael Wood of Entertainment Weekly rated it "B+", saying that "even if the themes on their 11th studio CD are a bit predictable, their muscular riffs and handsome vocal harmonies give the material a boot-scooting vibrancy". On August 10, 2009, Brooks & Dunn announced that they would be splitting up after a tour titled The Last Rodeo. According to Brooks, the decision to split was on good terms; he told CMT that he and Dunn are "still good friends", while Dunn said that "We've ended up more like brothers." The duo released its final compilation, #1s… and Then Some, on September 8 of the same year. The album features 28 past hits and two new songs. Both of these new songs, "Indian Summer" and "Honky Tonk Stomp" (featuring guest vocals from Billy Gibbons of ZZ Top), peaked at number 16 on the country music charts. 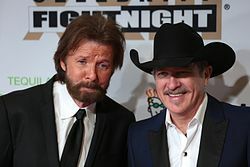 On May 23, 2010, CBS aired a tribute show presented by the Academy of Country Music titled The Last Rodeo, on which various country music stars performed Brooks & Dunn songs while the duo received a Milestone Award. The academy donated proceeds from the concert to help victims of the 2010 Tennessee floods. Brooks & Dunn performed their last concert together at the Bridgestone Arena in Nashville on September 2, 2010, with proceeds from the concert benefiting the Country Music Hall of Fame. Both members stayed with Arista Nashville as solo artists after the split. Dunn released his self-titled solo album in June 2011, which produced the top 40 country hits "Bleed Red", "Cost of Livin'" and "Let the Cowboy Rock". Dunn announced via Facebook on June 7, 2012 that he had exited Arista Nashville. Restaurant chain Cracker Barrel re-issued the album in late May with two bonus tracks; proceeds from the re-issue benefit the Wounded Warrior Project. In late 2013, Dunn sang duet vocals with Kelly Clarkson on a cover of "Baby, It's Cold Outside" from her Christmas album Wrapped in Red. Dunn's second solo album, Peace, Love, and Country Music, was released in 2014, followed by Tattooed Heart in 2016 on Valory Music Group's Nash Icon label. The latter features Brooks on the single "Damn Drunk". Brooks released the solo single "New to This Town", which features Joe Walsh on slide guitar. Brooks' first Arista album, also titled New to This Town, was released in September 2012. On December 3, 2014, it was announced that Brooks & Dunn would reunite and perform a series of concerts in Las Vegas, Nevada with Reba McEntire during throughout mid-late 2015. In 2016, they were selected as one of 30 artists to perform on "Forever Country", a mash-up track featuring the artists performing a medley of "Take Me Home, Country Roads", "On the Road Again", and "I Will Always Love You", which was released in celebration of 50 years of the CMA Awards. In February 2019, the duo announced a new album called Reboot, which features re-recordings of their previous singles with guest vocals from contemporary country music artists. In advance of the album's release, the duo issued two of its tracks: a version of "Brand New Man" with Luke Combs, and "Believe" featuring Kane Brown. In addition, Brooks & Dunn announced a concert in Dallas, Texas alongside their Las Vegas residency, as well as a March 2019 appearance at the Houston Livestock Show and Rodeo. Reboot was released on April 5, 2019. In 2019, the duo featured in season 16 of The Voice as battle advisors as a part of Team Blake. Brooks & Dunn have also contributed to several soundtracks and compilation albums. In 1994, they recorded "Ride 'em High, Ride 'em Low" for the soundtrack to the 1994 film 8 Seconds, and a cover of "Corrine, Corrina" in collaboration with Asleep at the Wheel for a tribute album to Bob Wills. Both of these cuts peaked at number 73 on the country charts while "Rock My World" was climbing. In early September 1994, the duo collaborated with Johnny Cash on a rendition of his song "Folsom Prison Blues" for the album Red Hot + Country, a charity album made by the Red Hot Organization to benefit AIDS awareness. Also that year, they covered "Best of My Love" on the Eagles tribute album Common Thread: The Songs of the Eagles. They covered Bob Seger's "Against the Wind" for the soundtrack to the cartoon King of the Hill; this rendition charted at number 55 in late 1999 based on unsolicited airplay. They also recorded "Keep On Swinging", which Brooks wrote with Five for Fighting, for the soundtrack to the 2006 animated film Everyone's Hero. Finally, they collaborated with Mac Powell on "Over the Next Hill" from the soundtrack to the 2008 film Billy: The Early Years, and took the song to number 55 on the country charts. Dunn has sung guest vocals on other artists' songs, including Lee Roy Parnell's mid-1994 cover of the Hank Williams song "Take These Chains from My Heart" (from Parnell's album On the Road), "Try Me" on Trisha Yearwood's 2005 album Jasper County, "Raise the Barn" on Keith Urban's 2006 album Love, Pain & the Whole Crazy Thing, and Ashley Monroe's 2006 single "I Don't Want To", which reached number 37 on the country charts. He also sang duet vocals with Carlene Carter on a cover of Johnny Cash and June Carter Cash's "Jackson" for the 2007 tribute album Anchored in Love: A Tribute to June Carter Cash. In 2011, he covered Gary Stewart's "She's Actin' Single (I'm Drinkin' Doubles)" for the soundtrack of the film Country Strong, and contributed duet vocals to Cledus T. Judd's parody of "God Must Be Busy", titled "Garth Must Be Busy". Dunn and Dean Dillon co-wrote Shenandoah's 1994 single "Darned If I Don't (Danged If I Do)" and the track "She Wants Me to Stay" on David Kersh's debut album Goodnight Sweetheart. He also co-wrote "Don't Leave" on Toby Keith's 2003 album Shock'n Y'all with Keith, and Reba McEntire's 2010 single "I Keep On Loving You" with Terry McBride. Brooks & Dunn co-wrote "Steady as She Goes" on Wade Hayes' debut album Old Enough to Know Better and "Our Time Is Coming" (originally an album cut from Hard Workin' Man) on his second album On a Good Night, while Dunn co-produced his 2001 album Highways & Heartaches. In January 2006, Brooks succeeded Bob Kingsley as the host of the radio countdown show American Country Countdown, while Kingsley moved to his own show, Bob Kingsley's Country Top 40. Brooks received an Academy of Country Music nomination for National On-Air Radio Personality in 2010, and again in 2011. Later that same year, he made his acting debut in an independent film called Thriftstore Cowboy. In 2011, he starred in a second film, The Last Ride. Steve Huey of Allmusic contrasts Brooks' and Dunn's voices, saying that Dunn "was the quietly intense singer with the soulful voice, while Kix Brooks played the part of the high-energy showman." He also describes their sound as "a winning formula of rambunctious, rocked-up honky tonk with punchy, danceable beats [alternated with] smooth, pop-tinged ballads." In the book The New Generation of County Music Stars, David Dicaire describes Dunn as "possess[ing] a soulful voice with a quiet intensity" and a "traditional country singer", while calling Brooks "the opposite to Dunn's musical personality," "a high-energy showman" and "the perfect accompaniment to his partner". Brooks sang lead on "Lost and Found", "Rock My World", "You're Gonna Miss Me When I'm Gone", "Mama Don't Get Dressed Up for Nothing", "Why Would I Say Goodbye", and "South of Santa Fe". In 2015, Brooks received the inaugural CMA Foundation "Humanitarian Award" as a reflection of his dedication to organizations such as Monroe Carell Jr. Children's Hospital at Vanderbilt, The Monroe Harding Children's Home, and the CMA Foundation. He was pivotal in the creation of the "Keep The Music Playing" program which is funded from proceeds of the CMA Music Fest. The campaign has provided more than $11M into Tennessee schools for music education since 2006. For several years, Dunn's annual "Rock The Barn" event at his home near Nashville raised money for charities such as Gilda's Club and the St. Thomas Breast Cancer Center. In the liner notes to each of their studio albums, Brooks & Dunn wrote short stories about Slim & Howdy, fictionalized cowboy versions of themselves. The duo worked with Bill Fitzhugh in late 2008 and wrote a book titled The Adventures of Slim and Howdy. Brooks & Dunn has 17 Country Music Association awards, 26 Academy of Country Music awards and 2 Grammy Awards. ^ a b c d e f g h i j k l Huey, Steve. "Brooks & Dunn biography". Allmusic. Retrieved 12 October 2010. ^ a b Huey, Steve. "Kix Brooks biography". Allmusic. Retrieved 12 October 2010. ^ a b c d e f g h i j Stambler, Irwin; Landon, Grelun; Stambler, Lyndon (1997). Country Music: The Encyclopedia. Macmillan. pp. 47–48. ISBN 978-0-312-26487-1. ^ "'You Made a Rock of a Rolling Stone' listing". Allmusic. Retrieved 10 May 2012. ^ "Let Me Be the First". Allmusic. Retrieved 21 May 2012. ^ a b c d e f g h i j k l m n o p q r s t u v w x y z aa ab ac ad Whitburn, Joel (2008). Hot Country Songs 1944 to 2008. Record Research, Inc. pp. 63–64. ISBN 0-89820-177-2. ^ Hurst, Jack (22 April 1990). "Earth calling... Help! Cautious Nashville is starting to turn green". The Chicago Tribune. Retrieved 12 May 2012. ^ Harris, Craig. "Ronnie Dunn biography". Allmusic. Retrieved 12 October 2010. ^ "Keepin' Me Up Nights". Allmusic. Retrieved 26 March 2014. ^ "Don Cook: Nashville's Reluctant Producer". Yamaha.com. Summer 2001. Archived from the original on 12 June 2011. Retrieved 8 October 2010. ^ a b c d "Search results for Brooks & Dunn". Recording Industry Association of America. Retrieved 12 October 2010. ^ a b "Brooks & Dunn: Awards". CMT. Retrieved 12 May 2012. ^ Gioffre, Daniel. "Brand New Man review". Allmusic. Retrieved 12 October 2010. ^ Nash, Alanna (1 November 1991). "Brand New Man review". Entertainment Weekly. Retrieved 12 October 2010. ^ a b Mansfield, Brian. "Hard Workin' Man review". Allmusic. Retrieved 12 October 2010. ^ Owens, Thom. "Waitin' on Sundown review". Allmusic. Retrieved 13 October 2010. ^ Cohoon, Rick. "She's Not the Cheatin' Kind". Allmusic. Retrieved 13 October 2010. ^ Nash, Alanna (30 September 1994). "Waitin' on Sundown review". Entertainment Weekly. Retrieved 13 October 2010. ^ Lewis, Randy (21 October 1994). "Brooks & Dunn". Orlando Sentinel. Retrieved 13 October 2010. ^ "Year End Charts - Year-end Singles - Hot Country Songs". Billboard.com. Archived from the original on 11 December 2007. Retrieved 12 October 2010. ^ a b Price, Deborah Evans (1996-12-07). "Brooks & Dunn: Award Winning Country". Billboard. 108 (49): 42. ^ "Our Brooks & Dunn". Grammy.com. Retrieved 2 July 2012. ^ Flippo, Chet (1997-02-01). "Nashville Scene". Billboard. 109 (5): 31. ^ McCall, Michael. "Borderline review". Allmusic. Retrieved 13 October 2010. ^ Nash, Alanna (19 April 1996). "Borderline review". Entertainment Weekly. Retrieved 13 October 2010. ^ Stephens, Larry. "Borderline review". Country Standard Time. Retrieved 13 October 2010. ^ "Reba and Brooks & Dunn Team Up for Duet". CMT. 1 April 1998. Retrieved 12 October 2010. ^ a b Price, Deborah Evans (9 May 1998). "Arista's B&D Set In Ties with Reba". Billboard. 110 (19): 41. ^ "Brooks & Dunn revive a classic". CMT. 21 September 1998. Retrieved 12 October 2010. ^ Pendragon, Jana. "If You See Her review". Allmusic. Retrieved 13 October 2010. ^ Oliver, Kevin. "If You See Her review". Country Standard Time. Retrieved 13 October 2010. ^ a b Dicaire, David. The New Generation of Country Music Stars: Biographies of 50 Artists Born After 1940. McFarland. p. 137. ^ a b Weisberger, Jon. "Tight Rope review". Country Standard Time. Retrieved 13 October 2010. ^ Erlewine, Stephen Thomas. "Tight Rope review". Allmusic. Retrieved 13 October 2010. ^ a b Allers, Hannahlee (18 February 2015). "Kix Brooks Explains Why Brooks & Dunn Almost Broke Up in 2000 — And What Kept Them Together Read More: Kix Brooks Says Brooks & Dunn Almost Broke Up in 2000". The Boot. Retrieved 23 February 2015. ^ a b Nash, Alanna (27 April 2001). "Steers & Stripes review". Entertainment Weekly. Retrieved 13 October 2010. ^ Kreps, Daniel (29 August 2008). "Brooks & Dunn Comment on Obama's Use Of 'Only In America'". Rolling Stone. Retrieved 2 July 2012. ^ Gilbert, Calvin (29 August 2008). "Obama Uses Brooks & Dunn's "Only in America" to Close Convention Speech". CMT. Retrieved 2 July 2012. ^ Dinoia, Maria Konicki. "Steers & Stripes review". Allmusic. Retrieved 13 October 2010. ^ Remz, Jeffrey B. "Steers & Stripes review". Country Standard Time. Retrieved 13 October 2010. ^ Erlewine, Stephen Thomas. "Red Dirt Road review". Allmusic. Retrieved 13 October 2010. ^ Nash, Alanna (18 July 2003). "Red Dirt Road review". Entertainment Weekly. Retrieved 5 November 2010. ^ Remz, Jeffrey B. "Red Dirt Road review". Country Standard Time. Retrieved 5 November 2010. ^ Horner, Marianne (10 October 2005). "Story Behind the Song". Country Weekly. 12 (21): 70. ^ Shelburne, Craig (15 August 2005). "A Wild Night With Brooks & Dunn". CMT. Retrieved 12 May 2012. ^ "Crow, Gill to Harmonize With Brooks & Dunn". CMT. 8 June 2005. Retrieved 13 October 2010. ^ a b Erlewine, Stephen Thomas. "Steers & Stripes review". Allmusic. Retrieved 5 November 2010. ^ "Brooks & Dunn Picky About Opening Acts". GAC. 2 June 2006. Retrieved 2 July 2012. ^ "Brooks & Dunn release Cowgirls single with Reba". Country Standard Time. 13 November 2008. Retrieved 13 October 2010. ^ Hall, Tara (7 April 2009). "Brooks & Dunn plot course for 'Cowboy Town'". Sound Spike. Retrieved 2 July 2012. ^ "Cowboy Town - Brooks & Dunn : Awards". Allmusic. Retrieved 2 July 2012. ^ Price, Deborah Evans (6 October 2007). "Sheriffs of Cowboy Town". Billboard: 41. ^ Hall, Tara (7 April 2009). "Brooks & Dunn plot course for 'Cowboy Town'". Soundspike.com. Retrieved 2 July 2012. ^ Erlewine, Stephen Thomas. "Cowboy Town review". Allmusic. Retrieved 10 May 2012. ^ Wood, Mikael (5 October 2007). "Cowboy Town review". Entertainment Weekly. Retrieved 10 May 2012. ^ Price, Deborah Evans (13 August 2009). "Brooks & Dunn Explain Why They Split". People. Retrieved 21 May 2012. ^ "Brooks & Dunn, Tim McGraw CDs Slated". Great American Country. 1 July 2009. Retrieved 21 May 2012. ^ "Brooks & Dunn chart history". Billboard. Retrieved 8 May 2012. ^ Myers, Megan (27 May 2010). "ACM Presents: Brooks & Dunn -- the Last Rodeo Tour". Yahoo! Music. Archived from the original on 9 February 2013. Retrieved 2 July 2012. ^ King, Caitlin (3 September 2010). "Brooks & Dunn End 20-Year Career at Nashville Show". Billboard. Retrieved 2 July 2012. ^ Erlewine, Stephen Thomas. "Ronnie Dunn review". Allmusic. Retrieved 8 May 2012. ^ "Ronnie Dunn chart history". Billboard. Retrieved 8 May 2012. ^ Duvall, Erin (8 June 2012). "Ronnie Dunn Parts Ways With Sony Music Nashville". The Boot. Retrieved 8 June 2012. ^ "Dunn releases special CD". Country Standard Time. 21 May 2012. Retrieved 28 June 2012. ^ Dukes, Billy (April 10, 2014). "Album Spotlight: Ronnie Dunn, 'Peace Love and Country Music'". Taste of Country. Retrieved 17 June 2017. ^ Erlewine, Stephen Thomas. "Tattooed Heart". Allmusic. Retrieved 17 June 2017. ^ Dauphin, Chuck (17 February 2012). "Kix Brooks' New Single a 'Freedom of Sorts'". Billboard. Retrieved 8 May 2012. ^ Conaway, Alanna. "Kix Brooks, 'New to This Town' (Feat. Joe Walsh) – Lyrics Uncovered". Taste of Country. Retrieved 8 May 2012. ^ Conaway, Alanna. "Kix Brooks to Release Debut Album September 11". Taste of Country. Retrieved 15 July 2012. ^ Anderson, Danielle (4 December 2014). "Brooks & Dunn, Reba McEntire to Headline New Show in Las Vegas". People. Retrieved 16 December 2014. ^ "30 Country Music Stars Join Forces for Historic CMA Music Video". ABC News. 22 September 2016. ^ "Brooks & Dunn Ready 'Reboot' Album With Kane Brown, Luke Combs". Rolling Stone Country. February 8, 2019. Retrieved February 11, 2019. ^ Reuter, Annie. "Brooks & Dunn Get a 'Reboot' With the Help Of Country Music's Up-and-Coming Talent". Billboard. Retrieved 5 April 2019. ^ Despres, Tricia. "Brooks & Dunn Join 'The Voice' as Team Blake Advisors". Taste of Country. Retrieved 5 April 2019. ^ "Red Hot + Country". Allmusic. Retrieved 12 October 2010. ^ "Common Thread: The Songs of the Eagles". Allmusic. Retrieved 13 May 2012. ^ "Keep On Swinging". Allmusic. Retrieved 21 May 2012. ^ MacIntosh, Dan. "Billy: The Early Years review". Country Standard Time. Retrieved 8 May 2012. ^ "Billy: the Early Years chart performance". Allmusic. Retrieved 8 May 2012. ^ Mansfield, Brian. "On the Road review". Allmusic. Retrieved 6 November 2010. ^ Sanineh, Kelefa (13 September 2005). "Critics' Choice: New CD's". The New York Times. Retrieved 8 May 2012. ^ Tamarkin, Jeff. "Anchored in Love: A Tribute to June Carter Cash". Allmusic. Retrieved 8 May 2012. ^ Conaway, Alanna (28 September 2010). "'Country Strong' Soundtrack Details Revealed". The Boot. Retrieved 14 December 2010. ^ Horner, Marianne (29 September 2010). "Ronnie Dunn Working on Solo Album". The Boot. Retrieved 14 December 2010. ^ Neal, Chris (2009-07-06). "Album reviews". Country Weekly. 16 (21): 50. ISSN 1074-3235. ^ Carlson, Mia (3 February 1995). "George Strait offers up the real thing". Lewiston Morning Tribune. Retrieved 8 May 2012. ^ Erlewine, Stephen Thomas. "Shock'n Y'all". Allmusic. Retrieved 22 May 2013. ^ Hackett, Vernell. "Reba McEntire Keeps on Relating to Songs ... and Fans". The Boot. Retrieved 2 July 2012. ^ Mansfield, Brian (1 September 2000). "COUNTRY". USA Today. Retrieved 8 May 2012. ^ "Q&A, KIX BROOKS ADDS DJ TO HIS RESUME `AMERICAN COUNTRY COUNTDOWN' TAPS HALF OF STAR DUO AS NEW HOST". Charlotte Observer. 25 December 2005. Retrieved 13 May 2012. ^ "Kix Brooks among ACM radio finalists". Country Standard Time. 4 February 2010. Retrieved 13 May 2012. ^ "Kix Brooks has Personality". Country Standard Time. 18 October 2011. Retrieved 13 May 2012. ^ "Kix Brooks turns to acting". Country Standard Time. 18 November 2010. Retrieved 13 May 2012. ^ Thompson, Gayle (4 March 2011). "Kix Brooks Plays Cowboy, Bank Robber in Upcoming Films". The Boot. Retrieved 13 May 2012. ^ Jessen, Wade (19 August 1995). "Country Corner". Billboard: 26. ^ Dickinson, Chris (31 October 1997). "The Greatest Hits Collection review". St. Louis Post-Dispatch. Retrieved 8 May 2012. ^ Evans, Deborah Price (15 March 1997). "Single reviews". Billboard: 64. ^ Price, Deborah Evans (1 May 1999). "Single reviews". Billboard: 22. ^ "Kix Brooks Honored as First Recipient of the CMA Foundation Humanitarian Award". CMAWorld. March 3, 2015. ^ "Brooks & Dunn Rock the Barn". CMT. November 19, 2003. ^ Netherland, Tom (14 December 2008). "Slim & Howdy review". TriCities.com. Retrieved 14 December 2010. ^ "Rollicking with two country musicians". The Roanoke Times. 21 September 2008. Retrieved 14 December 2010. ^ Sculley, Alan (8 May 2008). "Brooks & Dunn still live up to hard-workin' reputation". Hampton Roads.com. Retrieved 14 December 2010.